This is the first game in the Valkyrie Profile series. 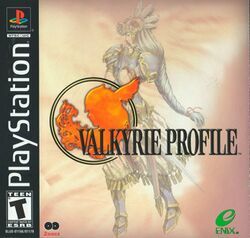 For other games in the series see the Valkyrie Profile category. Valkyrie Profile (rebranded as Valkyrie Profile: Lenneth for the PSP remake) is an RPG with some platforming-esque elements. You play as Lenneth Valkyrie, the middle of the three Valkyrie sisters, a Valkyrie who is charged with finding the souls of slain warriors to recruit for Ragnarok, the final battle. The game is partially non-linear, as there are 3 possible endings, and over 20 characters to recruit. This page was last edited on 4 November 2008, at 05:00. This page has been accessed 23,869 times.